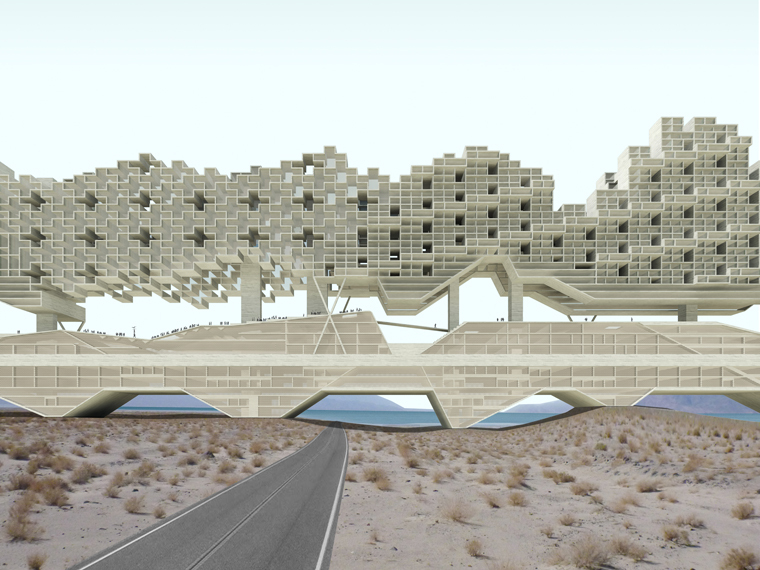 UrbanLab, elevation of aqueduct, 2014, Death Valley, CA. 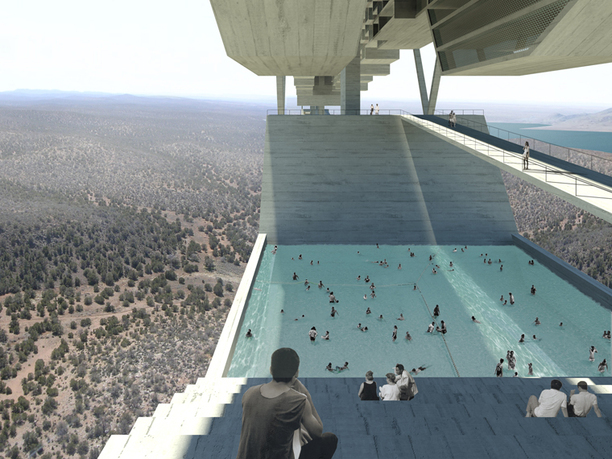 Bowling: Water, Architecture, Urbanism asks: Why, as a discipline, do contemporary architects counter huge crises with small ideas? Architects once thought and theorized the huge (both huge problems and huge solutions). In addition to unprecedented opportunities to design large-scale public works projects in the postwar period, architects in the 1950s and '60s eagerly took on the large-scale cultural and environmental problems of the day. Bowling seeks to reposition the contemporary debate of what a city should be by exploring how city-scaled mega-forms can become an updated architecture-based urbanism—a conjecture of what a comprehensible city could be to combat (predicted) crises—through analysis and experimentation. Through the filter of productive contemporary crises, the urban-scaled architecture project can engage and exploit existing infrastructural conditions as a catalyst for urban invention. Sarah Dunn received her BA from Columbia College and her MArch from the Graduate School of Architecture, Planning and Preservation at Columbia University. Dunn is a partner in the architecture and urban design firm UrbanLab in Chicago. 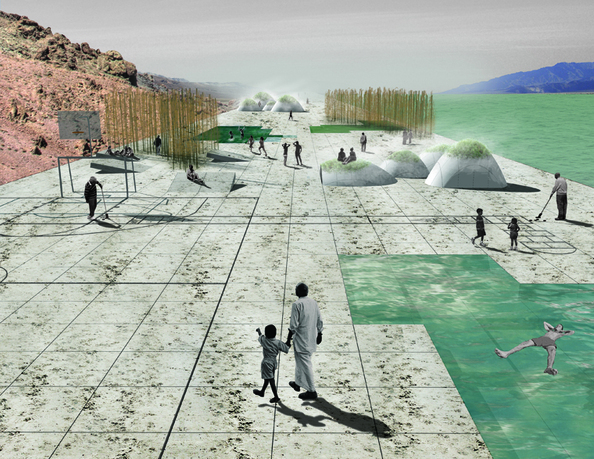 UrbanLab won the AIA College of Fellows Latrobe Prize (2009), was selected as an Emerging Voice by the Architectural League of New York (2010), and exhibited at the Venice Biennale (2012) and the Chicago Architecture Biennial (2015). Dunn is also an associate professor at the University of Illinois at Chicago. Martin Felsen received his BArch from Virginia Tech and his MS from the Graduate School of Architecture, Planning and Preservation at Columbia University. Felsen is a licensed architect and a partner in the architecture and urban design firm UrbanLab in Chicago. 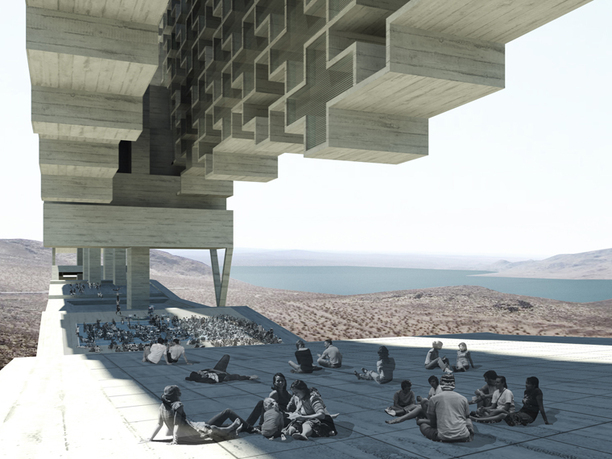 Felsen is an associate professor at the Illinois Institute of Technology, College of Architecture. Felsen serves on the Board of Places Journal Foundation, the Board of Archeworks, and the Editorial Advisory Board of the Architect's Newspaper.